Question Bridge: Black Males is a collaborative multimedia project in which over 150 black men—from across the United States and also across age, class, profession, and sexuality— together explore some of the most troubling, poignant, personal, and sometimes incongruous aspects of their lived experiences. Shown as a five-screen installation, Question Bridge utilizes multiple platforms to facilitate a conversation between participants who ask and respond to each other’s questions. The result is a deeply insightful, emotionally layered conversation, which delves into the depths of the private lives and social concerns of diverse black men across the United States. Remarks by Chris Johnson at 6:00 p.m. 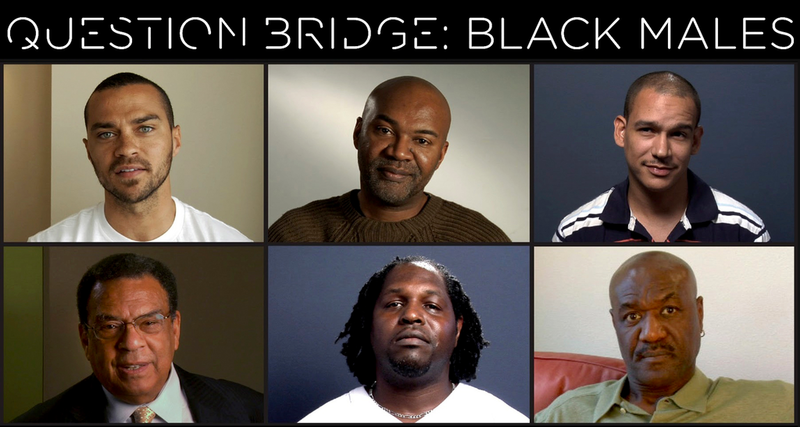 Question Bridge: Black Males was created by artists Chris Johnson, Hank Willis Thomas, Bayeté Ross Smith, and Kamal Sinclair. The video work is in the collection of the Smithsonian National Museum of African American History and Culture, the Brooklyn Museum, and the Oakland Museum of California. The exhibition catalogue, Question Bridge: Black Males in America, was published by Aperture in 2015. The exhibition is presented by the Mary Porter Sesnon Art Gallery in partnership with the Institute of the Arts and Sciences (IAS).